Thank you to Delta Children for gifting this jogger and collaborating with me. As always all thoughts and opinions are 100% my own. Having a child changes your life in so many ways. Ways you may not have thought it could change. For example, you probably didn’t realize how little you would get time to yourself for simple things, like going for a run or going pee. Because Izzy is with me all day, everyday (we do not have childcare) I don’t get a break unless she’s in her bedroom sleeping. Unless my husband happens to be working from home I obviously can’t go anywhere. Getting in the gym has been difficult. Getting up early in the morning before the house wakes up dwindled. Now that the weather is getting warm I’m looking for activities to keep myself active and healthy. I want Izzy to see healthy choices and learn the importance of caring for her body. So here are some ways you and your busy self can stay fit while caring for your kiddos. Not always easy to do with kids, however if they are in their floats you can tread water for exercise. Also swimming with Izzy while holding a kick board works great. Her favorite of all, last summer, was jumping in the pool. I would catch her and then help her climb out. This was a great arm workout. If your kids are playing on the steps of your pool you can hold onto the stairs and kick your legs for a little cardio too. So, there really are ways to work on your fitness with your kiddo(s) at the pool. I’ve always loved running. Weird to some maybe. For me running is a mental escape. I would turn on my headphones and just go! I could push hard through anything bothering me and completely exhaust my anxiety. Up until very recently Izzy has hated the stroller. I know, unheard of right? Someone tell me your baby was the same. She ALWAYS wanted to be held. It’s honestly a miracle she walked at 9 months. 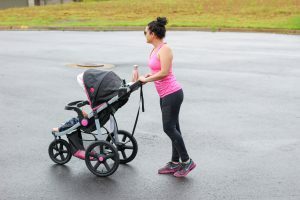 So now that I’m not running solo and running with a baby carrier isn’t ideal… lol I have a jogger. What jogger am I using and LOVING? 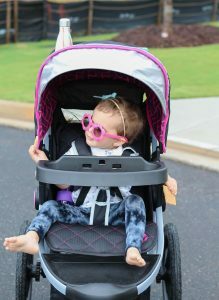 The J is for JEEP® Brand Adventure All-Terrian Jogger Stroller. It’s super lightweight and easy to maneuver. I easily go over bumps or sidewalk edges with it. It’s a smooth ride for Izzy and she loves that the tray is easy for her to reach. Not all stroller trays are easy for her, this one is perfect. I really like that I can put my phone and water up in the top console. 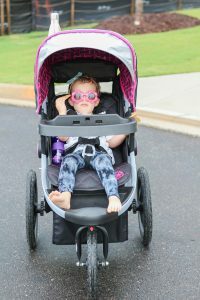 Also this stroller’s all-terrain rubber tires are filled with air making it easy to maneuver on and off-road. The front swivel wheel can also swivel lock to help with straight and stable movement when walking fast or jogging. The handle also comes with a safety tether that you can attach to either wrist. Storage & Portable? 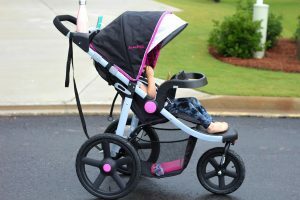 The stroller folds very quickly and compactly. You can also remove the back tires and stow them away. Okay best of all, this stroller is super affordable guys and that is key… because kids are expensive and so it all their “stuff”. Izzy loves going to the playground, even if it’s the one in our neighborhood. I go up the equipment with her and down the slide, I chase her all around. Guys it’s a workout, but a fun one and I’m engaging and building memories with my child as I do this too. Alright guys, get outside and work on your fitness. You can do it! Set an example for your kid(s). Oh I love this stroller! Loving that stroller! I need to get outside running again! You go, mama! That’s such a cute jogger, I wish they made a double like it! Great advice here. I loveeeeee swimming with my kids for fitness! I need a new jogger so bad! I plan on spending a lot of time in the pool this summer staying cool! Great looking stroller! I have a double but it just is too heavy with 2 kids ? 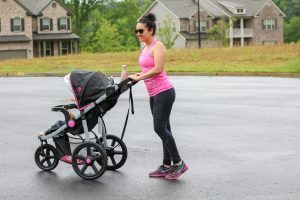 I’ll take all of the tips I can get when it comes to staying active with kids! That stroller looks awesome! this stroller is to die for! I love the colors and big wheels! Jogger strollers are so helpful when is mamas are trying to keep in shape!